Well, here they are after a stain/wash of Minwax Tudor Satin. Their coats were highlighted prior to the staining process. After the stain is thoroughly dry they'll be sprayed with Testors Dullcote. 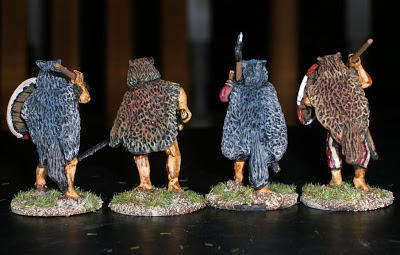 Shot of the rear of the figures - some of the details aren't really defined, especially at the sides, but are good enough for close ordered troops. These are from the box that Pat L. (aka Socal Warhammer) was kind enough to award me at Enfilade! last year. Pat had stepped up for the annual historical convention here in WA State and hosted a WAB tournament - actually really low-key and practically all of the 12 or so participants knew each other from past games and got along very well. Pat arranged to have Brookhurst Hobbies sponsor the event and provided a bunch of great prizes - enough for all participants. In fact, my prize was for coming in last place and being a good sport about it. Anyway, I've just now managed to have the motivation to start on them. 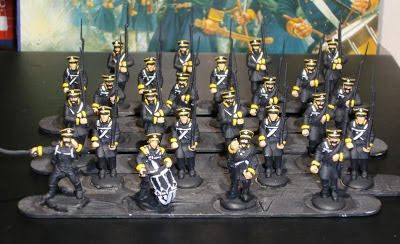 Here they are with just the flesh, yellow facing/piping and white equipment belts block painted over a black undercoat. I know folks have disparaged this set for their large hands, but they don't bother me. In fact, I find them quite charming and so far enjoyable to paint. Besides the large right fists on some - which there are only three marching poses besides the three metal command figures - some of the details aren't very defined. 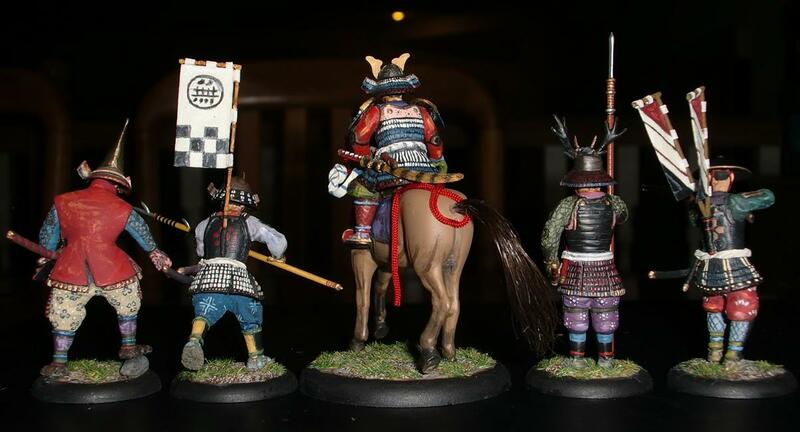 For instance, the continuation of belts and such are missing or very vaguely sculpted on the sides of the figures. I don't find this much of a problem as they'll be ranked up and the overall effect should be fine. 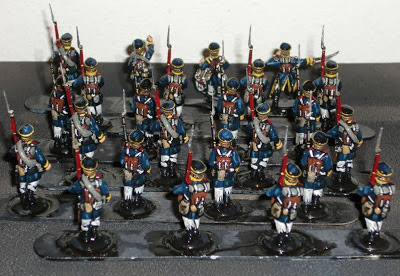 Someday they'll be fielded in a Black Powder game - probably along with the Russians I already have as a polyglot unit to beef up the British. Here's a small group of 1:35th scale plastic models that I worked on many years ago - before I got into gaming and was more into modelling. 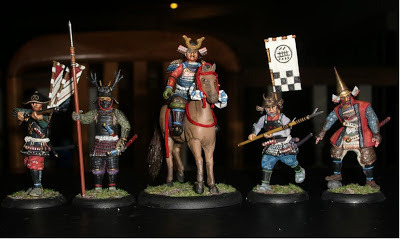 The box art showed one mounted samurai so I thought it would be a large single-figure kit. As everything was printed in Japanese, I was surprised to find a bunch small multi-part figures. I went ahead and put them together and went a little wild with a hot knife and putty modifying their poses and also adding details like mail and plates on their sleeve armor. I had forgotten about them and discovered them recently while rifling through boxes of junk. I glued back some broken off pieces and mounted them on bases from Warmachine (30mm for the foot and 50mm for the mounted figure). The banners are made from tissue paper soaked in white glue. The tall eboshi helmet as well as the arquebusier's hat were made from heated plastic and a putty. Thread was used for the helmet cords - as my wife is a trained seamstress, we always have stuff like that around. The mounted guy was actually supposed to sit on a field chair, but put him on the horse instead. I think the guy with eboshi helmet was the one for the horse. The horse tail is a lock of hair donated by my wife. The arquebuse is actually a Brown Bess musket from a 54mm Airfix kit with its stock modified a bit. The cloth horse reins and also the cloth belts holding the short swords are also made from tissue paper soaked in white glue. The tassels on the horse are from some long forgotten ornament. The figures are a bit crude looking (especially the horse! 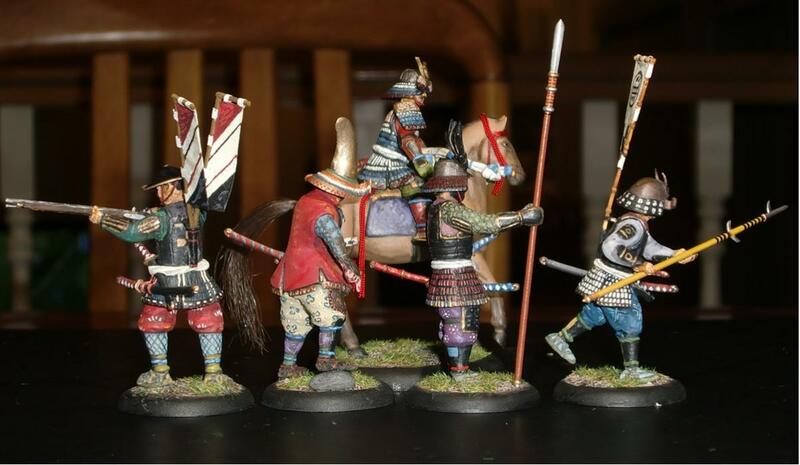 ), but I learned a lot about Sengoku period armor from the research which has helped me with my more recent projects. 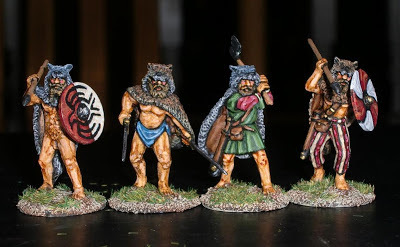 Here is the final unit for my 6 point SAGA Viking Warband - they're a unit of Beserkers which will be interesting to see in combat. My buddy Scott A. gave them to me awhile ago as he had spares - I finally had the motivation to paint them today. 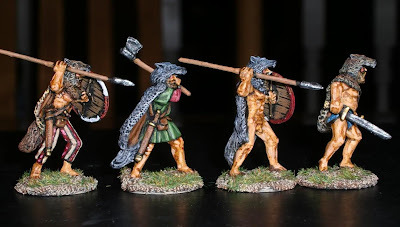 Actually I had painted their flesh and given them a wash about a week ago and just had the hardest time picking up a brush. 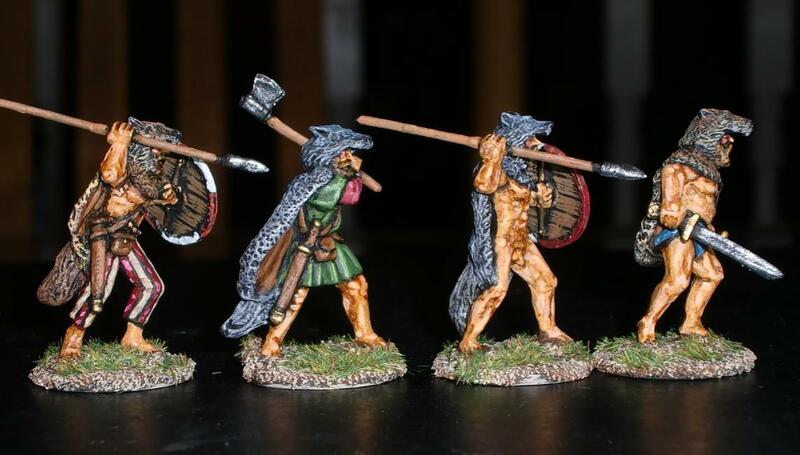 The wolf skins were fairly easy to paint - mostly dry-brushed; two in grey and two in brown. An old copy of WAB's Shield Wall was a great reference for the coloring. The shield patterns were also shamelessly lifted from Shield Wall pictures. Interesting enough, I passed up a chance for some SAGA games today which were hosted by my buddy Dan P. at Drumbeat - the annual game day up in Seattle. I had some family commitments (my youngest son's dental check up, etc. ), so used my spare time to finish these guys. 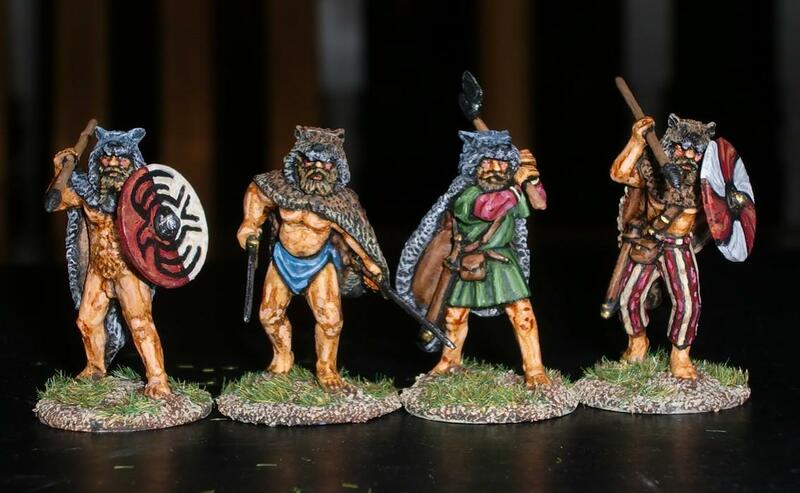 Oh well, at least my Viking Warband will be ready for the next opportunity. 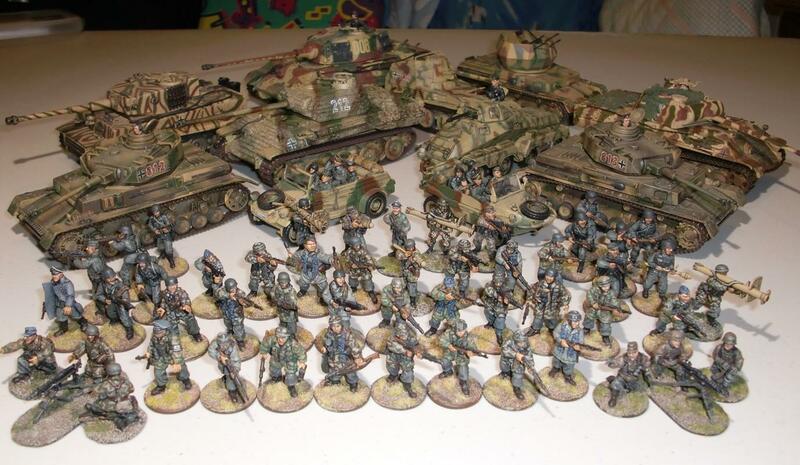 In the photo above all the vehicles except for one Panzer IV are excluded from this 1,000 point German army. 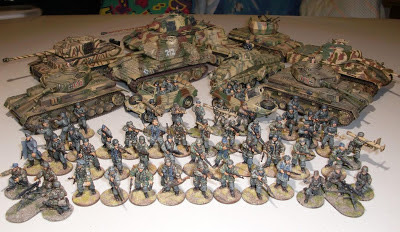 The figures for the army, which are in the foreground, include an officer, three squads of Fallshirmjager (Veterans), two smaller squads of Inexperienced Heer, one each HMG and Panzerschreck teams, and finally a lone Panzer IV. 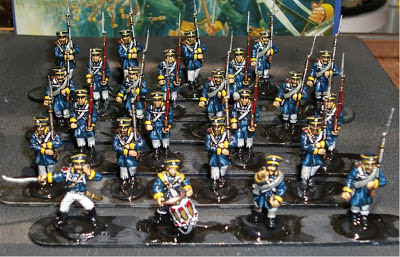 The next photo shows all of US forces I have available, but again only the units in the foreground are part of the 1,000 point army. 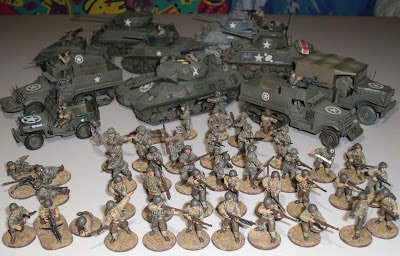 The US force is made up of an officer riding the jeep, two squads of Veteran Infantry (4th Armored Division) riding in M3 Halftracks with MMGs, two Veteran Airborne (101st) squads, a Medic (mainly because I have a figure for it and available on the list), two .30 Cal. MMG teams, one of which has a 3/4 ton transport, one each Sniper, Flamethrower and Bazooka teams, and finally one M10 tank destroyer rated as Veteran. 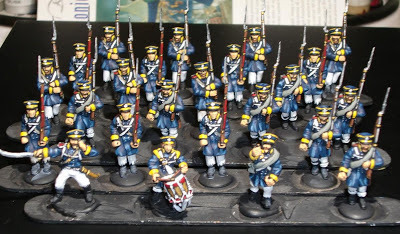 Of course, these are only preliminary lists and will likely need a lot of adjustments after reviewing the rule book proper, but at least it gave me a rough idea of the limitations of troop types and armament. I'm pleasantly surprised that a lot of the local crew have really picked up on these rules - just like SAGA. 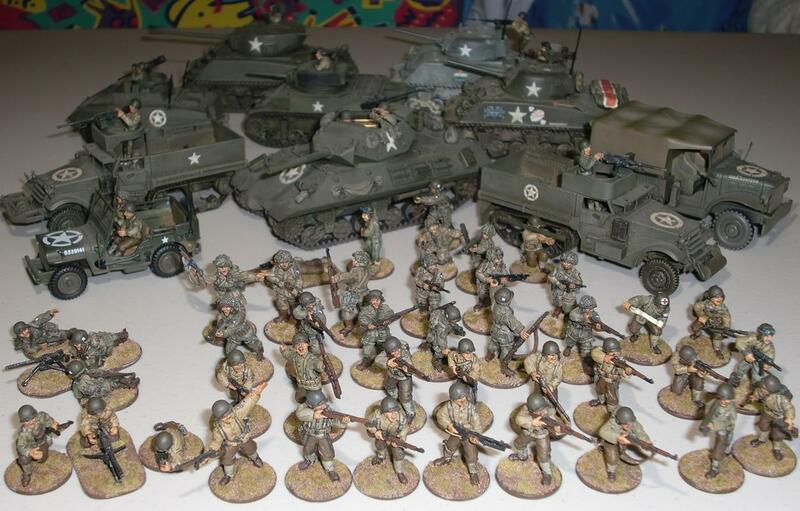 I can get my WW2 stuff on the table again. Well, here is the first completed project for 2013. 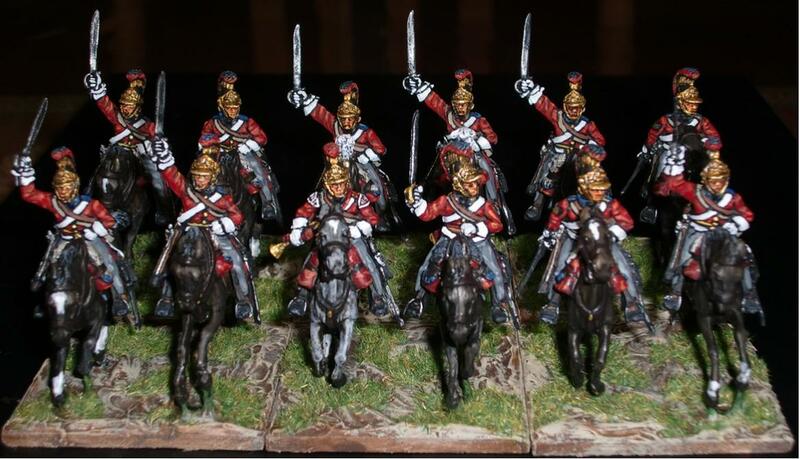 A unit of Perry British Household Cavalry painted up as Life Guards. 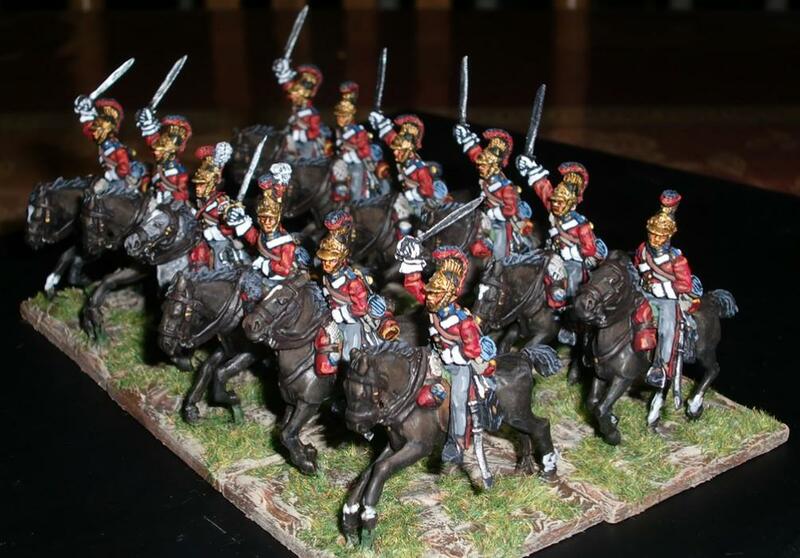 Alternatively, they could be painted as Blues, but red coats were chosen as they are unmistakably British. Over a brown base coat, the horses were given a wash of black and then a healthy stain of Minwax Tudor Satin. It really gave them the look of "blacks" - as the Household Cavalry are known to have ridden, and indeed still do to this day. 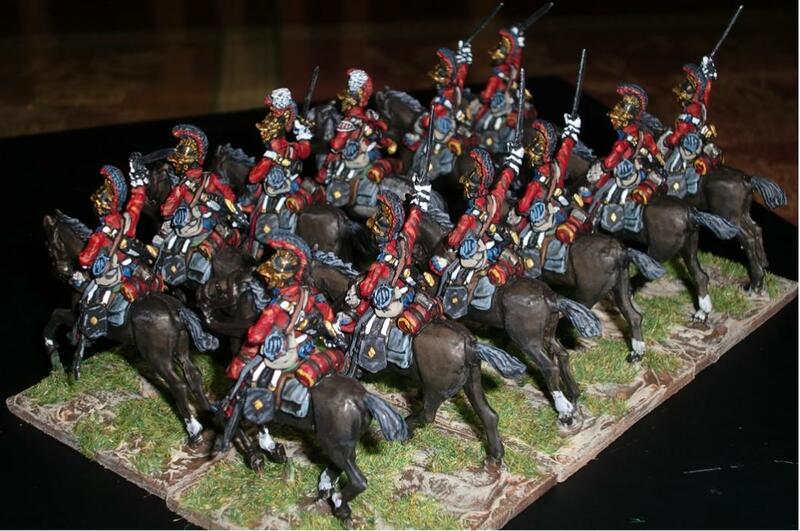 I used a bit of Green Stuff to secure the riders more securely to their mounts. You may be able to see some of this in the photos. I'll paint those areas black after the super glue dries. 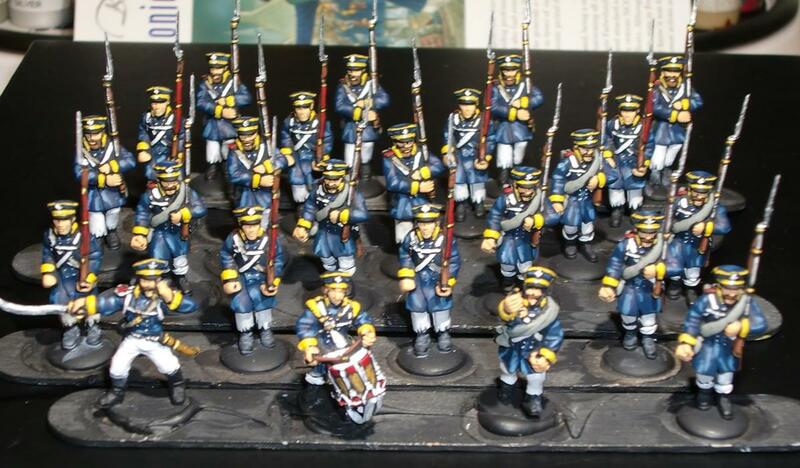 All in all a nice unit to paint up, but I wonder how the same unit produced by Renegade would look compared to them. I think they might be larger and possibly give the proper effect of these Heavies. I understand they had a fairly tall height requirement to enter the Guards. 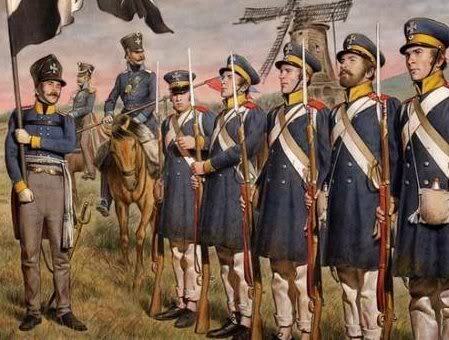 Something like 6 feet plus - and riding large horses must've made these guys pretty imposing on the battlefield. EDIT: this height requirement is not substantiated. :) Incidentally, the famous actor Ray Miland (The Man with the X-Ray Eyes) served in the Royal Horse Guards The Blues. I also think their broadswords could've been sculpted a little larger or thicker - kind of the way Front Rank does theirs; pretty sturdy for gaming. Anyway, please don't take these comments as complaints - I am very happy with the overall look of these figures. 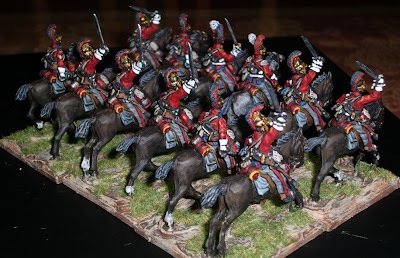 After a few other projects and commitments, I plan to host a Black Powder game with these along with the rest of the Napoleonics collecting dust on the shelf. I may also pick up a copy of Albion Triumphant - for the eye-candy if nothing else. Again, best wishes to all of you this year and hope you all have great days ahead painting and gaming - Dean. 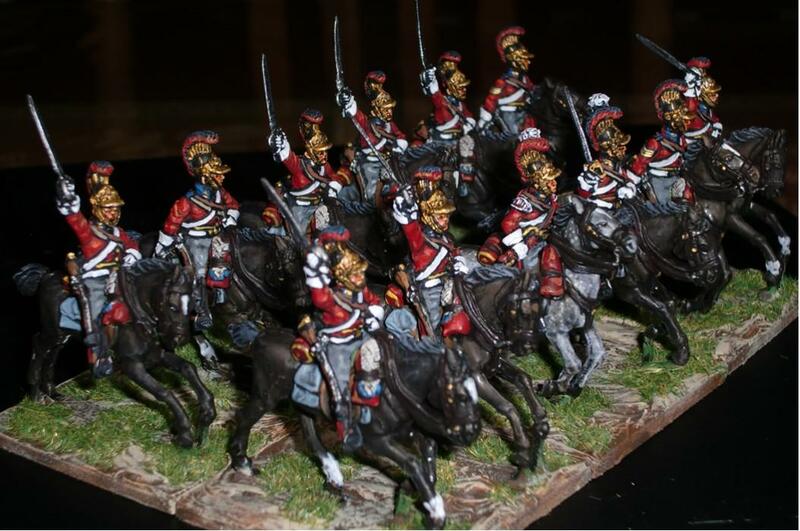 The cavalrymen are finished - painted as Life Guards. Although the Royal Horse Guards ("Blues") look just as nice, I wanted them to look as British as possible - so red coated Life Guards they are. I'm sure the Perrys research their subjects thoroughly, but I've yet to find a source showing the musician having winged epaulettes (or "birds nests") as depicted here. The only thing I have a little problem with are their broadswords. They have a sort of falcata-look to them - not as heavy looking as I'd think they should look. Everything I've read has the British heavy cavalry sword being fearsome looking and heavier than their French counterparts' swords. Still a very nice set of sculpts as would be expected from the Perrys. The horses are up next; a black undercoat has been followed by a brown one. Hopefully the Minwax stain will darken them a bit more as they are supposed to be blacks. For some time now, I had been looking for an inexpensive painting rack or carousel. Yesterday, my wife picked up this kitchen thingee from TJ-Maxx for about $13.00. In turn, it's sitting in a carry tray so it can easily be moved into hiding if we have guests. A multi-tiered carousel was my first choice, or possibly a suitable spice rack - but this one with two side-by-side carousels seems a decent alternative. 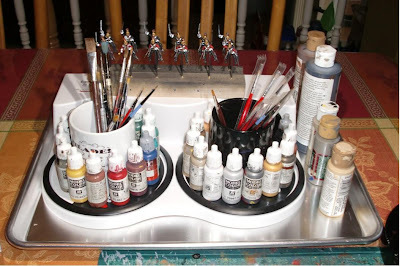 Previously my paints were in a small plastic bin. It was a little frustrating looking for paints as they were all thrown in a single drawer that had them rolling around in all directions and in no order. Now, I will try to keep them in some type of order by color range. I've also been painting on the kitchen table so I can watch TV - at least intermittently. Anyway, it at least seems more efficiently organized now. UPDATE: My wife suggested I place the coffee mugs with brushes inside the center of the carousels. 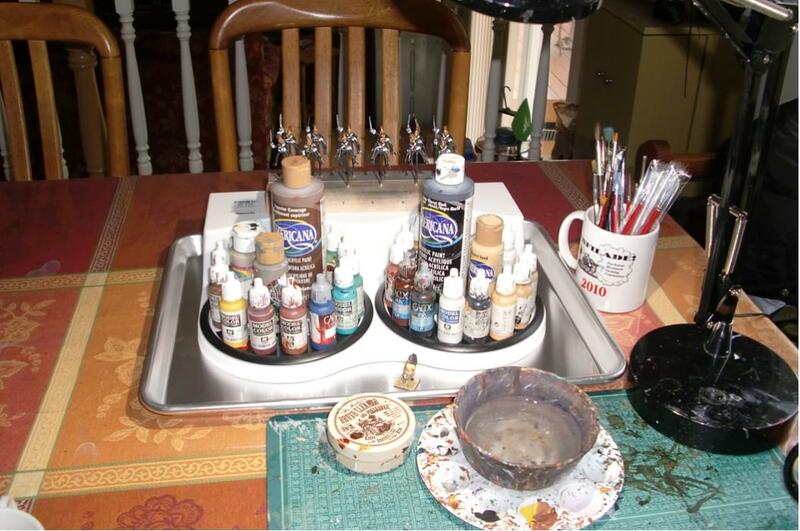 With the mugs siting in the center, the paint bottles now have a sort of back stop - keeping them from tipping over. As my wife always says, "You need to listen to me." She is usually right 10 out of 10 times. Just a quick post to show what I'm working on. 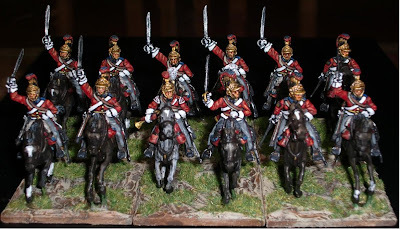 This is a WIP shot of a unit of Perry Household Cavalry which will join the British in the Peninsula and later on at Waterloo. Using a technique I picked up from veteran painter Doug H., I painted the details over a black undercoat before painting the clothing proper. Next will be the red coats for the Life Guards. NOTE: I now see I missed the top of a cross belt on one of the figures - not the first time I've found errors when reviewing pics on the blog - not a bad thing. I picked this unit up from a generous TMP sale recently. Being a great price I couldn't pass it up as I felt my British force needed more cavalry, especially a heavy unit. Now I'm heading out the door to meet my buddy Pat L. at The Game Matrix for another WAB refresher game. My Trojan War Chariot Army versus his Seleucids - this time he is bringing an elephant or two.